Imogiri is the official cemetery of the royal descendents from Yogyakarta and Surakarta. This cemetery located on a beautiful hill about 12 km from Yogyakarta. The royal graveyard is reachable by 345 stone steps leading to it. Imogiri is about 17 km Southeast of Yogyakarta and easily accessible by the bus of car. The tombs are built within three main courtyards. 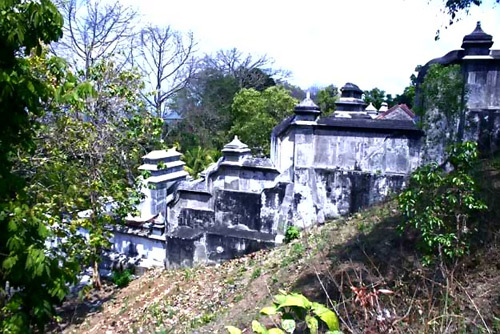 This Graveyard is the tomb of Sultan Agung Hanyokrokusumo, the third king of the Islamic Mataram Kingdom. All the kings of the Mataram Kingdom, from Sultan Hamengku Buwono I until Hamengku Buwono IX and their families as the Surakarta Kingdoms as well were all buried at the Imogiri Royal Cemetery. This cemetery was built in 1645. Everyday many people visit Imogiri and step up on 345 stairs to reach the top of the hill where the tomb of the kings rested. Entry into the smaller courtyards housing the tombs of the princes is allowed, but the tomb can only be visited only on Monday 09.00 – 12.00 and Friday 13.00 – 16.00. The visitors must wear the traditional Javanese dress, which however can be hired on the spot at a modest fee. The cemetery is closed during the Moslem month of Ramadhan.